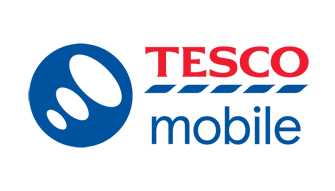 Tesco Mobile review 2019: what is that makes their customers so happy? We put Tesco Mobile's network coverage and 4G speeds to the test, plus review their other benefits to see why they receive so few complaints. Last updated: January 12th 2019. 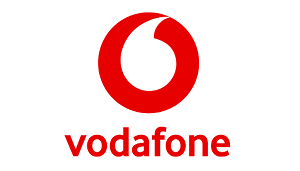 "We still think Tesco Mobile are a solid choice for a lower-cost SIM only deal or phone contract on a quality mobile network, it's just their benefits are looking a little threadbare compared to some of the competition." Is Tesco Mobile's network any good? You’re probably aware that Tesco Mobile runs on the O2 network in the UK. That means wherever there’s O2 signal, there’s also Tesco Mobile. So if you’ve been on O2 before, there’s no good reason you won’t get identical reception - very useful given Tesco Mobile are generally cheaper. 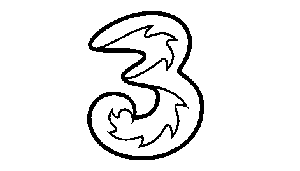 The current stats show that 99% of the population can get Tesco Mobile's 4G (99% 3G and 2G too), which puts it in joint 2nd place (with Vodafone behind EE). This data is for places people live, not the landmass of the UK. But reception away from residential areas is important too. The new battle is for geographical coverage, on roads, rails and in the country. We'd still recommend checking signal in places like your route to work/school. 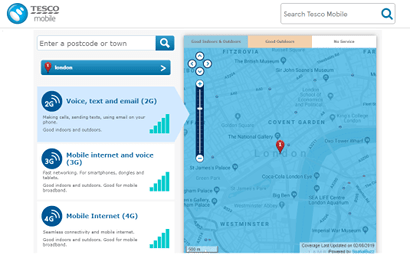 Useful link: Check your Tesco Mobile coverage with their 4G/3G network map. 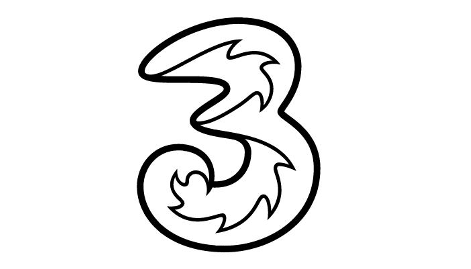 While coverage is likely to be no problem on Tesco Mobile, we expect the 4G download speeds you’ll get on their network not to be as quick as some of their rivals. 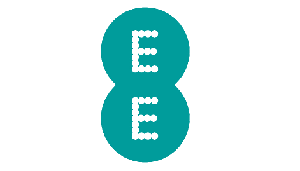 Customers on O2 directly are estimated to get typically around a 16 Mbps download speed over a 4G connection, which is lower than the other three major networks (EE, Vodafone and Three). 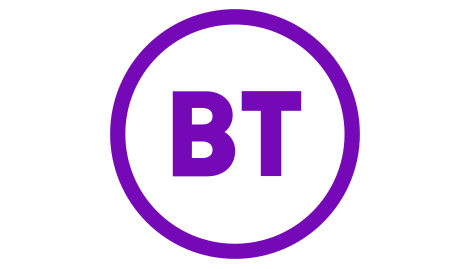 At that kind of speed, you’d still be able to browse the internet fast and watch videos in standard quality on Tesco Mobile without buffering, you just won’t be able to download massive files as quick. For that reason, we can only give Tesco Mobile an average rating in this category. We still think it’s important how your phone performs on each network for calls, even though most people use their mobiles mainly for internet and other data-using activities. Every year P3 Network Analytics test how quickly calls connect on each network and how good the audio quality is too. Again, they only publish results for O2 itself so we can only assume how Tesco would perform. The results give Tesco's hosts a 'satisfactory' rating, compared to EE (very good), Vodafone (good) and Three (good). So not the strongest performance but not a disaster either. 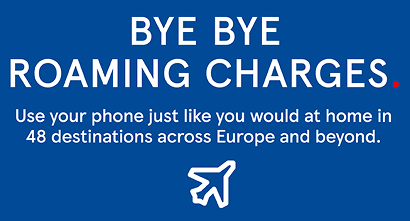 You might have heard of WiFi calling because it’s offered by the four main networks O2, EE, Vodafone and Three (and now iD too!). It essentially lets you make calls over WiFi instead of conventional mobile signal. This is very useful for when you find yourself somewhere that normal signal can’t get like underground or in a building with thick walls. 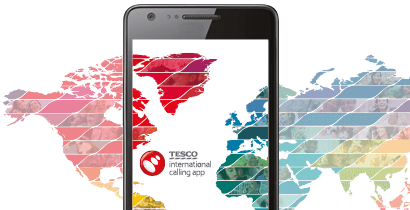 Unfortunately Tesco Mobile don’t offer any WiFi calling similar to the main networks. The closest they get is an international calling app, which works over WiFi but isn’t meant for domestic calls. And it's not actually included as part of being on Tesco Mobile. 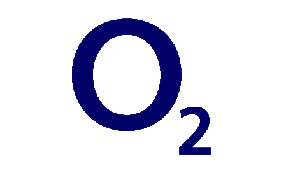 If you were interested in Tesco Mobile because they use O2, you might want to take a look at O2 themselves directly. We rate O2's WiFi calling scheme as one of the UK's better ones. 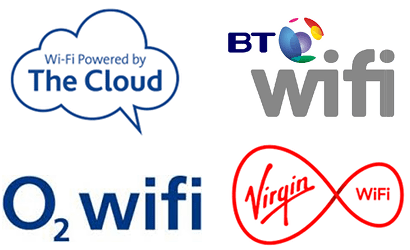 One benefit we see with some of the larger providers is giving their customers access to free WiFi hotspots in the UK and abroad. This isn’t something Tesco Mobile offer their customers so we’ve rated them poor for it. That’s a shame because using WiFi instead of mobile signal is an excellent way of saving your monthly mobile data allowance and helps avoid charges for going over your limits (see costs for this on Tesco Mobile here). On the other hand, we wouldn’t recommend getting too hung up about not having free WiFi from your mobile network. There’s more and more free WiFi becoming available on the high street anyway. Some lower-cost networks like iD Mobile restrict tethering but we’re pleased to say that Tesco Mobile do not, so they’re among our recommended networks for this. It means you’re free to set your phone up as a mini WiFi hotspot that you connect other devices to. To do this, your phone uses Tesco’s 4G/3G mobile signal and converts it into a WiFi signal. Remember though that tablets and laptops connected to your phone via a personal hotspot will likely use up data more quickly than you would just using your mobile itself. This is another activity that could tip you over your data limits (see extra charges here). 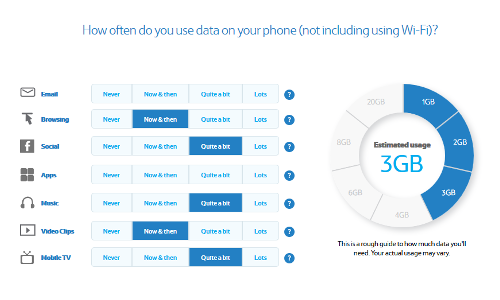 If you’re into tethering, you might want to use Tesco’s handy data calculator to make sure you get a plan with enough data for it. For an already lower-cost network, it’s good to see Tesco Mobile offering free roaming in these 48 countries in the EU (but remember this is now mandatory for every pay monthly UK network). It’s called Home From Home. Home From Home means you can take even Tesco’s cheapest pay monthly deals and be able to use your regular minutes, texts and data (up to 12GB) without paying extra in the EU (full terms and conditions here). For going anywhere else in the world, you’ll still have to pay for roaming per minute, text and MB data (see all Tesco’s costs abroad here). In our guide to the best networks for roaming, Tesco come behind our winners Three, whose Go Roam scheme offers free roaming in 71 destinations worldwide and could be worth a look if you’re a big traveller. Most mobile networks have something that they lead all others on and with Tesco Mobile it’s always been spending caps (although Tesco's thunder has been stolen a bit now every network has to offer them). Either way, there were the first provider to let you voluntarily limit how much extra you’re willing to spend on top of the normal monthly cost of your plan, with their Capped Contracts, which are available with phones or SIMs. 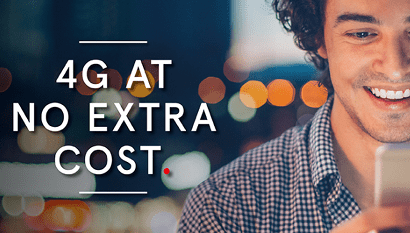 Extra costs include things like going over your allowances, calling premium numbers or roaming (see what costs extra on Tesco Mobile here) and the limit you set can be between £0 and £100 a month (or no cap). If you hit the limit, services that'd cost you extra are automatically blocked, while anything free is still allowed. 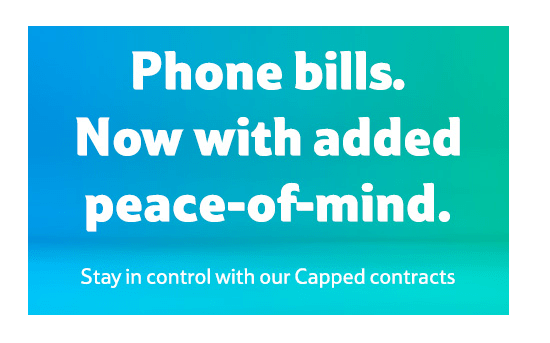 We’ve all racked up extra bills before and it can be unnerving if you’re taking out a mobile contract someone else like a child or spouse. Tesco’s Capped Contracts take away that worry and we commend them for it. 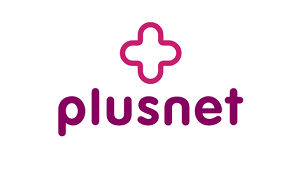 We’re also always on the lookout for how networks look after groups of people who want to share mobile plans and get a discount or extra perks. Tesco Mobile currently occupy our second slot (after BT’s Family SIMs). It’s all thanks to their flexible Family Perks scheme. This lets you have more than one monthly mobile plan on a single account, which makes it more manageable. But you’ll also get a choice of extra benefit on top. For the main plan on your account and extras you add, you get to choose from bonus minutes or data, monthly money-off discounts or even more Clubcard points for every person (see every available Perk here). What we like about this is the fact that you’re free to change the perk you get each month and per each user. So if you need more data one month but fancy money-off the next, it’s fine to switch it up. 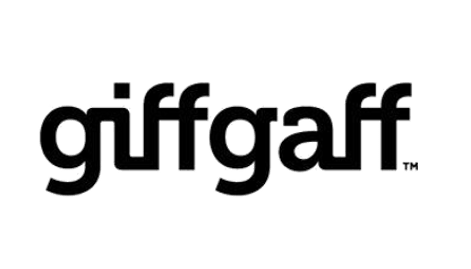 More of the bigger (and admittedly often more expensive) networks are now a free subscription to selected streaming services as part of your mobile package. 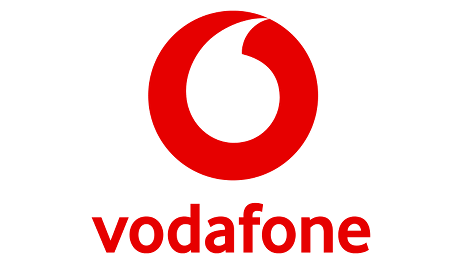 The best examples are Vodafone, whose top-tier deals come with your choice of a subscription to Sky Sports Mobile TV, NOW TV or Spotify Premium. 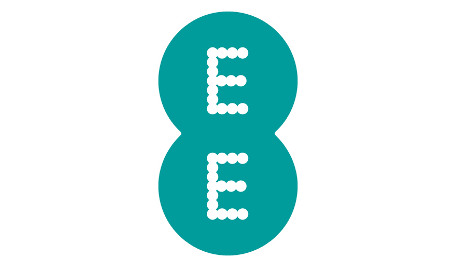 Or EE offer 6 months free Apple Music and 3 months BT Sport App. You won’t get either of these on Tesco Mobile but we wouldn’t say this is a huge problem. Use our deal comparison tool below and you’ll see Tesco almost always work out cheaper than EE and Vodafone. 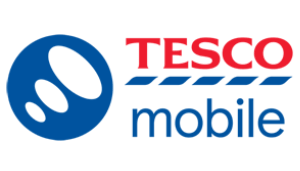 Data rollover: Tesco Mobile don’t have it - so use it or lose it! Data usage is probably the part of your plan that people are most concerned about as it can change each month. Some networks offer some clever plans with what’s known as data rollover. This basically means if you have leftover data at the end of the month, you get to keep it for the future rather than losing it. Tesco Mobile don’t offer this so we’ve given them a poor rating. 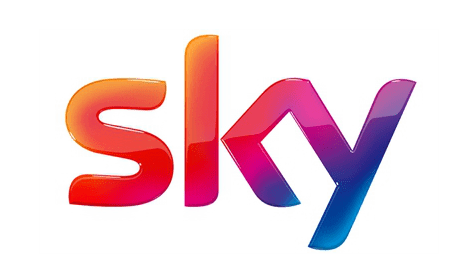 We rate Sky Mobile’s data rollover as the 2nd best in the UK, plus they also use O2, so are an alternative to Tesco if you’re interested in this type of plan. 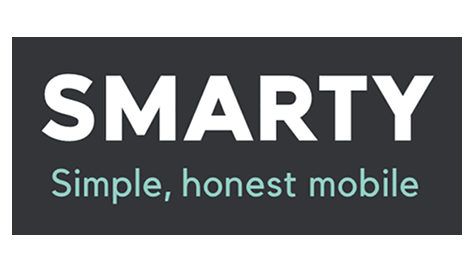 We also really like new network SMARTY's discounts off your next bill for unused data, which means you can never be on too big a plan. 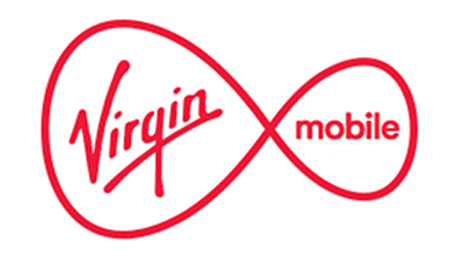 Other networks with data rollover are iD Mobile and Virgin Mobile. 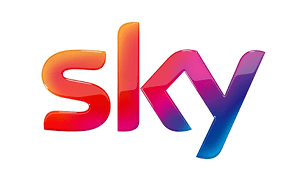 Another trend with higher-cost main providers in the UK is giving away free social media or streaming data. 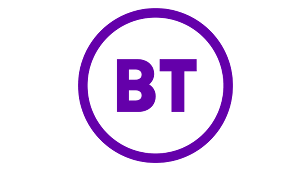 The best example is Three’s Go Binge, which gives you an unlimited data allowance for watching Netflix and streaming these selected other entertainment services (read our Go Binge review here). 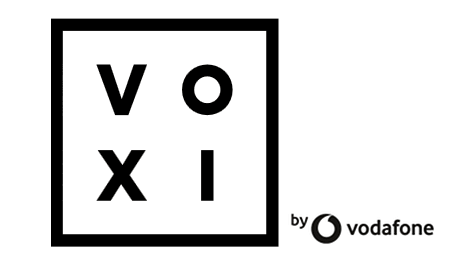 EE are also giving away 6 months free data for listening to Apple Music, Virgin Mobile let you use WhatsApp, Facebook Messenger and Twitter without using data and Vodafone’s new VOXI offers endless social media. It’s a pity Tesco don’t offer anything like this as these are regularly data-hungry activities. The more free data you get, the more you have spare for everything else or you can take a smaller, cheaper plan in the first place. Practically every phone in Tesco Mobile’s pay monthly range is available exclusive on their Anytime Upgrade contracts. Only the very cheapest budget phones are on traditional 24-month contracts. Anytime Upgrade is similar to O2’s Refresh. 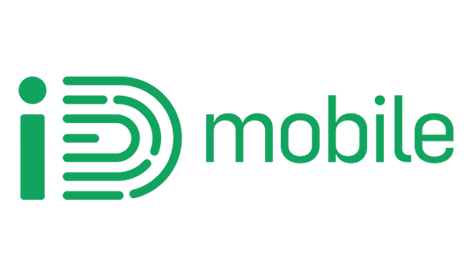 It splits your overall mobile deal into two parts: one payment covering the cost of your phone over 24 months, and another for your monthly minutes, texts and data. Added together these make up the total cost of your deal. 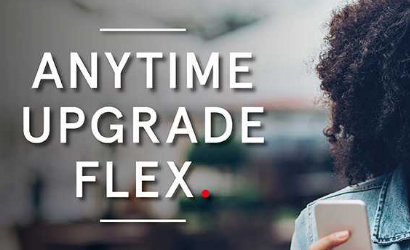 The reason you can upgrade early is that the phone is paid for on a credit agreement (basically a loan for the cost of the device). Each month you pay off 1/24th of the loan until it’s all gone. But if you want, you’re free to pay off the whole remaining balance, at which point you’re free to upgrade to a new phone or leave Tesco altogether. 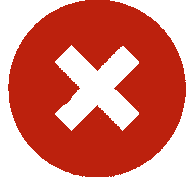 While we think it’s great that you can upgrade early, it’s worth saying that you might find it harder to be accepted for a deal on Tesco Mobile than other providers. That’s because you’re effectively applying for a loan and Tesco have to prove to regulators that they are lending to people responsibly, who can afford it. 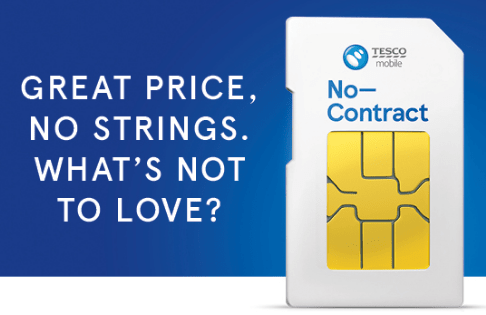 In terms of price, we rate Tesco Mobile as cheaper than average for their phone contracts. 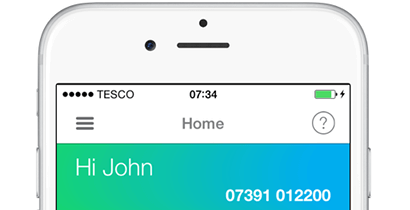 If we’re honest, Pay As You Go isn’t the main strength of Tesco Mobile. 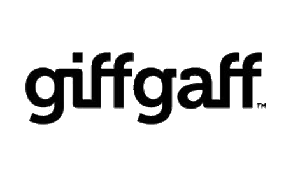 For a good PAYG deal with a cheap provider using O2’s network, we’d recommend reading our giffgaff review and our £5 free credit offer. 1) Triple credit tariff: top up with e.g. £10 and Tesco will make it £30. Calls, texts and data are paid for as you use them at these pretty expensive rates and your bonus credit only lasts a month. 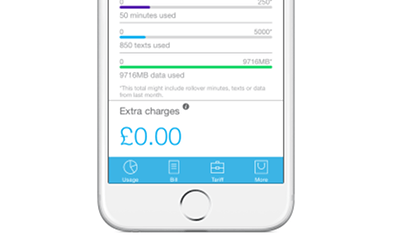 Rocket packs: monthly bundles of minutes, texts and data that you buy out of your credit. These work out a little more expensive than the dominant PAYG networks like giffgaff or The People’s Operator. 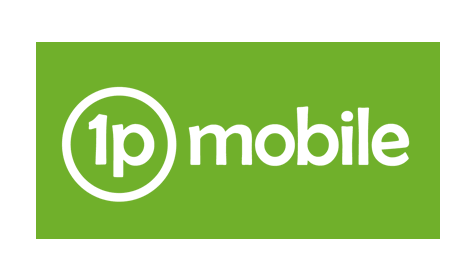 If you’re the type of person who just wants to add a bit of credit and only use your phone every now and then, Tesco Mobile are as good a choice as anyone else. As the biggest of the virtual mobile networks (ones that use another provider’s masts for signal), Tesco Mobile are big enough to appear in Ofcom’s data on how many complaints they receive per 100,000 customers. 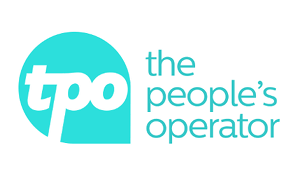 Ofcom are the government's regulator of the telecoms industry. And it's where you can go to resolve disputes with mobile networks, if they've not satisfactorily dealt with your complaint. 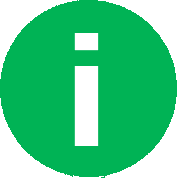 For us, their information is more reliable than websites that have been set up for people to go and whinge about their mobile provider. After all, who bothers to go those sites if they're happy? 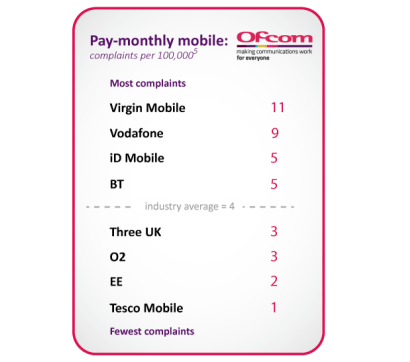 Out of all the major mobile networks (ones with over 500,000 customers), Ofcom receive the fewest complaints about Tesco Mobile per 100,000 customers. That means Tesco Mobile customers are happy. Either they've not got anything to complain about. Or when they do complain, Tesco Mobile are good at dealing with the issue. 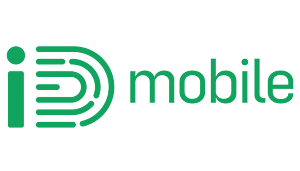 If you've had a rough experience with one of the other mobile networks, Tesco Mobile should be a much better choice. They have also received numerous other awards throughout the past years (see link below).